MS PowerPoint presentations - where do fish live in the oceans? Outcome - Provides examples of living things that live in specific locations that suit their needs. Indicator – researches one species of fish and makes a short computer generated presentation to the class about where that fish lives and why. 1. 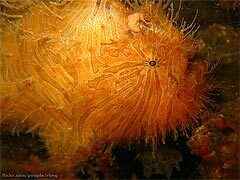 Show children an image of a deep ocean fish such as an Angler fish. 2. Ask children if they have ever seen a fish like this when swimming in the ocean, where do they think this type of fish lives? 3. Explain that there are many different places to live in the ocean (called habitats) and the class is going to research some of the fish that live there. e. anything this else they know or find interesting about this fish. 6. Direct children to the Australian Museum website, show them how to navigate to ‘Fishes by habitat’ and allow them time to research their fish. 7. Children present their research to the class.